01-017.2DF Stage 2 Dual Friction Clutch Kit: Jeep CJ J-10 Wagoneer- 10-1/2 in. 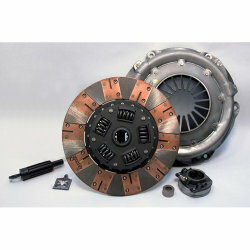 This is a Phoenix Friction Stage 2 Dual Friction Street Performance Clutch Kit. It will provide up to a 30% increase over the stock engine torque capacity. At the same time, you will not notice any increase in pedal effort over the stock clutch and offers chatter-resistant lift-off for a great daily ride. The clutch disc has a bonded ceramic button facing on the flywheel side and a high quality woven organic facing on the pressure plate side for smooth engagement and increased holding power. A Phoenix Stage 2 Dual Friction Street Performance product is a direct factory fit and requires no modifications for installation. 10-3/8" x 10T x 1-1/8"